Shakshuka is eggs with tomato sauce. The first time i tried something like this was when i was little and my dad used to make us huevos escalfados, the south of Spain version (this had chorizo in them, they were dreamy). 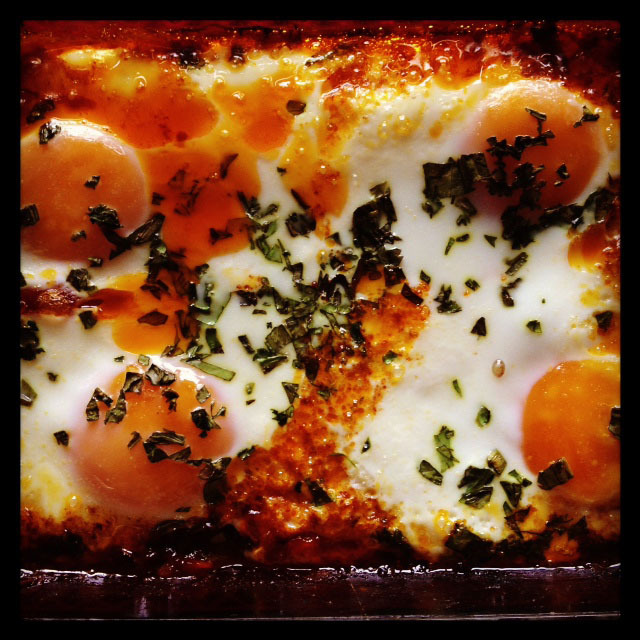 Then years later when I went to Israel, I rediscovered this amazing dish, with a different name: Shakshuka. Pre heat the oven at 425 F. Chop the tomatoes in small cubes and put in a heat resistant dish. Add in the chopped garlic, olive oil (like 1 tablespoon), paprika, salt and cayenne or habanero sauce (to taste ,depends on the level of spice you like). Mix and lay it evenly in the dish and put in the oven for around 15-20 minutes (until the tomatoes are soft and are releasing this amazing roasted aroma). Take the dish out and break the eggs on top of this sauce, sprinkle with cilantro and put back in the oven for around 5-10 minutes (depends on how soft or cooked you like your eggs). This dish is super yummy with tahina on top and a great piece of rustic bread for dipping. Bete’avon! Shakshuka es huevos con salsa de tomate. La primera vez que probe algo parecido fue cuando era chica y mi papa nos hacia huevos escalfados, la version del sur de España (esta tenia chorizo, eran un sueño). Años despues cuando fui a Israel, redescubri este plato, con un nombre diferente: Shakshuka. Pre calienta el horno a 425 F. Pica los tomates en cubitos y ponlos en un pyrex resistente al calor. Agrega el ajo, aceite de oliva (como una cucharada), paprika, sal y cayena (o salsa de aji chombo, al gusto, depende que tan picante te gusta). Mezcla y distribuyelo equitativamente en el pyrex y ponlo en el horno de 15-20 minutos (hasta que los tomates esten suaves y soltando un aroma increible rostizado). Saca el pyrex y ponle los huevos encima a la salsa, echale el cilantro picadito y pon devuelta al horno por 5 a 10 minutos (depende de cuan suaves o cocidos te gustan los huevos ). Este plato es super yummy con tahina encima y un buen pedazo de pan campesino para mojar la salsita. Bete’avon!